Mark your calendars! Opening SATURDAY, SEPTEMBER 9TH! My one and only gallery show of the year! It is at the lovely GABBA GALLERY and if you make it out, you will get a free 24x36 inch poster! I'm aiming to make this a special one so don't miss it! In case you didn't know, this is a "you broke it, you bought it" kinda deal. "Scars are not injuries. A scar is a healing. After an injury, a scar is what makes you whole." And all the while we'll agree that it was better in the old days. I had a blast taking part in Mortified! Thanks to all of you who made it out! I feel so much closer to those who heard my creepy teenage love poems written to Katie Holmes and angry rock lyrics. As the Mortified saying at the end of every show goes: "We are freaks and we are fragile, but we survived." "Inside every cynical person, there is a disappointed idealist." 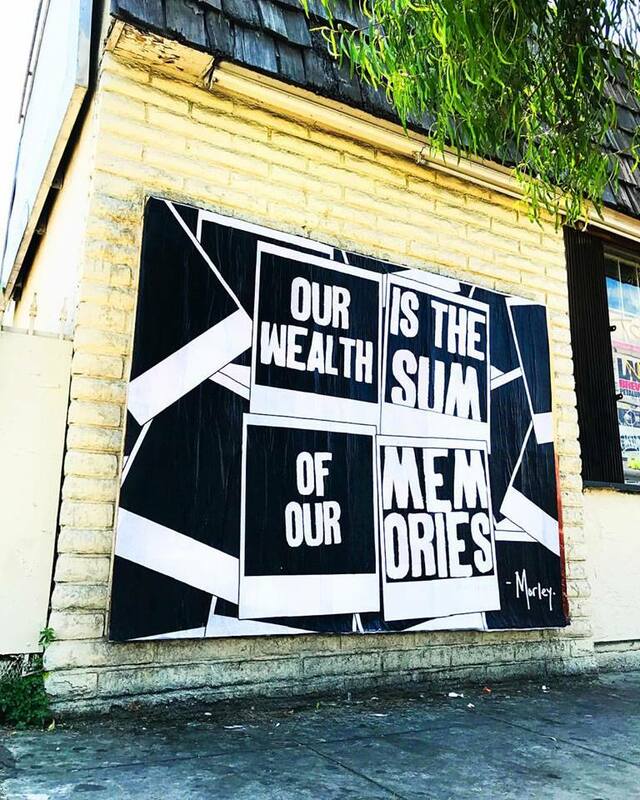 And may we all be richer than our wildest dreams. This was a piece for the Mtl en Arts festival in Montreal. Translated it says "Let's Fall in Love Like Both Our Parents Aren't Divorced." Today marks seven years that I've been married to my wife and this sentiment is truer for us now than it was when we met. Love doesn't have to be chained to the odds of something lasting. A love without cynicism is one of the best things in life. I was asked by Ovation TV to design a shirt for their Stand For The Arts program which works to raise support to protect funding for arts and culture programs that are under threat of being cut from the federal budget. These programs make up minuscule amounts of our budget (like less than half of a half of a percent) and offer vital programs (things like arts education for kids, art therapy for soldiers with PTSD and obviously way more). 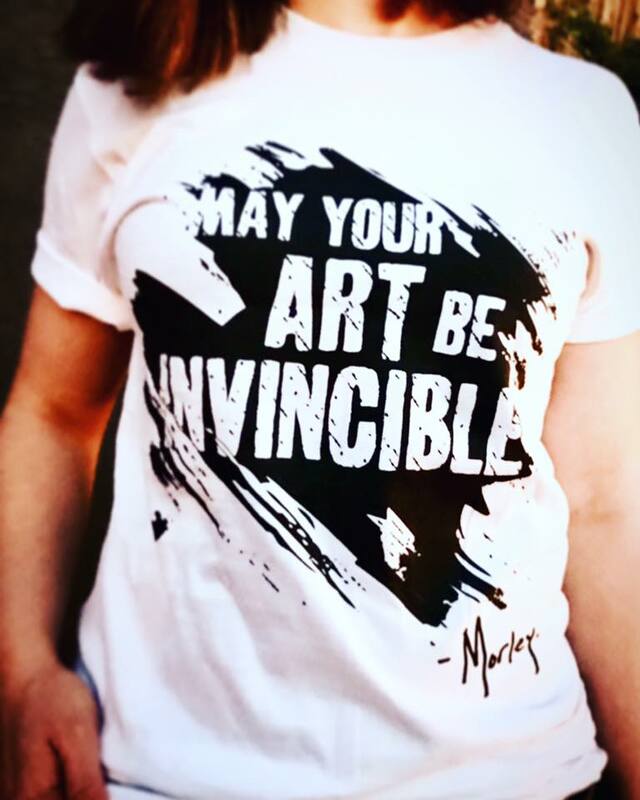 These shirts aren't for sale, just promo for their organization at events they have, but seeing as how the arts is important to me and has been throughout my life, hearing members of our government say that it's not even 0.006% a priority is concerning. Visit www.StandForTheArts.com to learn more about how you can help. I painted a wall of the new Food Haus Cafe 1600 E Chevy Chase Drive Glendale, CA 91206. Shot on August 1st, 2017. Pasted with EARL LUBE PASTE. In the worst of times you must remember that you are not alone. There are a lot more of us pressing on towards the dawn than you think. We're with you and we're in this together. 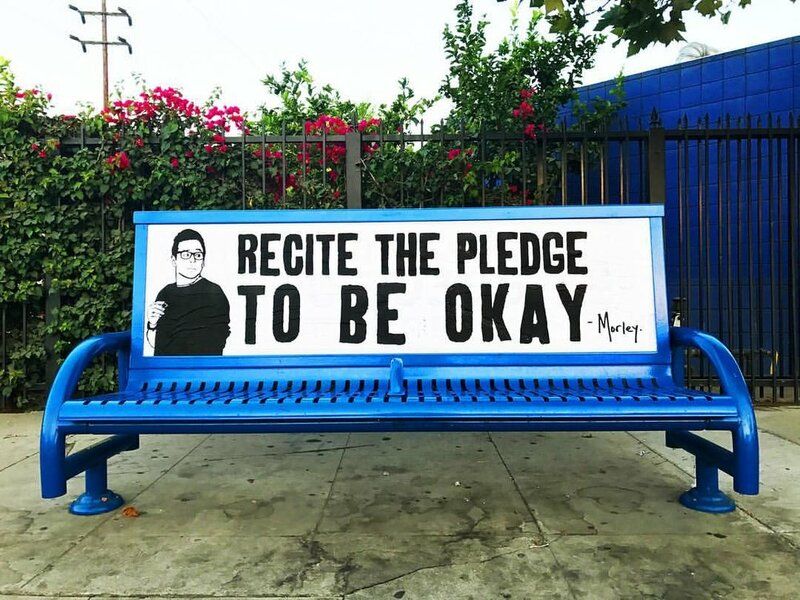 I took over this bus shelter in Los Feliz. These spots never last long as the advertisers take them back hastily but I always enjoy seeing my pieces under glass. "Ghosting" is one of the most infuriating social behaviors of my generation. The notion that simply not responding to someone is an acceptable way to communicate "no thanks" is absurd. Let's respect each other enough to know that we can handle hearing "you seem like a great girl/guy but I don't really feel a connection" or "hey, thanks for inviting me but I won't be able to make it" or "sorry, we went in another direction" or even "sorry, I'd help you move but I just really don't feel like it." I feel like we all would rather hear NO than silence. Because silence is just NO without common courtesy. You're not saving anyone the pain of rejection- you're telling them they're not even worthy of your rejection. That you would rather simply forget they even exist- which is much more cruel in my mind. Let's all be big boys and girls and just be honest with people and simply say "no thanks." Far too often we think we're chasing an accomplishment when really we're chasing the feeling we hope that accomplishment will give us. Then once the accomplishment is reached and that hollow feeling remains, you simply move on to the next peak. Sometimes you think you want something and only after you get it you realize how little you actually enjoy having it. Some dream jobs turn out to be nightmares. Some people whose affection we pine for turn out to be incompatible with us. This poster is meant to reflect the fact that it's not enough to say "I hope you reach your goals!" because there's not just one moment in life where you cross a finish line, there's everything after that begs the question of who you are on the other side. Nevertheless we play such sweet music. "To desire is to obtain; to aspire is to achieve." She was like when you aren't paying attention and that one red sock sneaks in and changes everything.